American Airlines has dropped the price of a few flights from Vancouver to Memphis, Minneapolis, and Atlanta down to $268 CAD roundtrip including taxes. 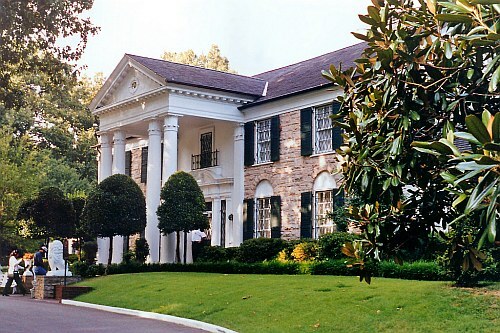 Memphis, Tennessee is perhaps the most interesting one, as it's pretty rare to see an amazing price to Memphis. 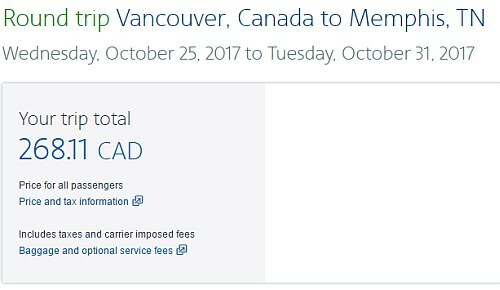 There's only a few dates showing this price, but thought I would share it in case we have any Elvis fans on YVR Deals. ^^ Try clicking on a departure date of October 25th or November 4th 2017. ^^ There are quite a few other dates throughout 2017/2018 in the low $300s roundtrip. 2. Click on the departure date box to open up the calendar view and look for the cheap date combinations that are $269 CAD roundtrip. Click through from Google Flights to the American Airlines website. vancouver, yvr, flight deals, american airlines, memphis, mem, tennessee, atlanta, georgia, atl, united states, salt lake city, slc, minneapolis, msp, detroit, dtw, north america, utah and michigan. 2 Responses to "Vancouver to Memphis, Minneapolis, Atlanta, and Salt Lake City - $268 CAD roundtrip including taxes"
Just nailed myself a great price for travel to Memphis from YVR in early December! Thank you so much for the heads up!